Germ Clear™ Bird Droppings Disinfectant Spray is a specifically formulated product to help clean and remove pigeon guano prior to the installation of Defender™ Bird and Pigeon Spikes. In order to install bird spikes to proof your property from pigeons, seagulls and other birds, the surfaces and ledges must be clean to ensure a firm fix when the pigeon spikes are glued down. Germ Clear™ has the added benefit of disinfecting the area, killing off the dangerous bacteria lurking in bird droppings that can cause all sorts of health issues. 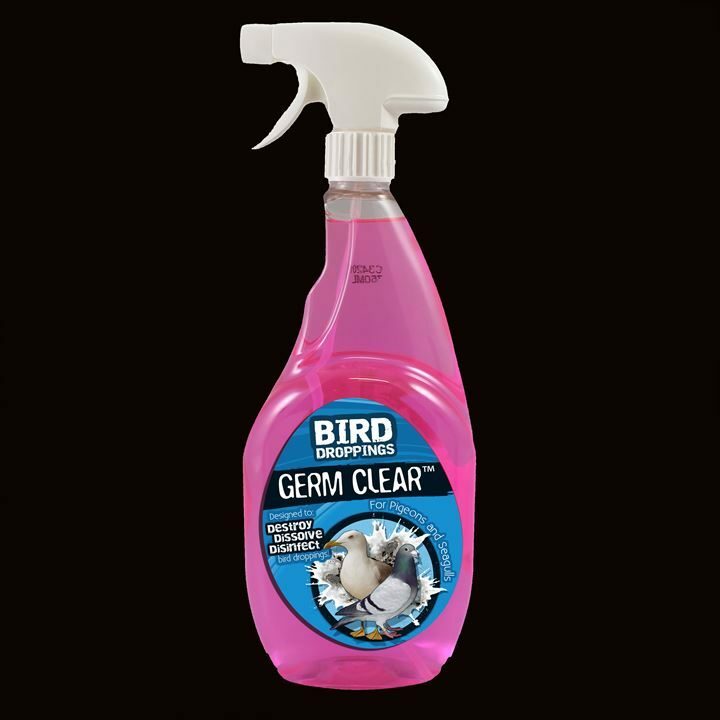 Germ Clear™ Bird Droppings Disinfectant has been designed to make the cleaning of ledges or window sills quicker and easier. When birds nest or roost on ledges around your home or business, they inevitably leave mess behind. This will be in the form of nesting materials, such as leaves, twigs and feathers, and of course a lot of pigeon poo. This pigeon guano is not only unsightly but also causes damage to buildings by discolouring brick and stonework. There are corrosive acids in bird droppings that result in dissolving stonework causing irreversible damage that can cost thousands of pounds to repair. Germ Clear™ will help loosen dirt and old pigeon guano whilst at the same time preventing bird dropping dust forming. Dust that forms from bird droppings can carry serious health risks if breathed in, so wearing a dust mask while carrying out the cleaning is recommended. The spray will dampen the dust in the area to be treated, softening the debris and making removal of bird droppings much easier. Pigeons harbour up to 60 different types of diseases, and their nesting materials and pigeon guano carry further nasty types of bacteria. When cleaning an area previously inhabited by roosting pigeons or nesting birds, Germ Clear™ Disinfectant Spray is very effective at eliminating these types of bacteria, particularly Pseudomonas Aeruginosa, E.Coli, Staphylococcus Aureus, Enterococcus Hirae and MRSA. Germ Clear™ complies with BS EN 13697 against these stated micro-organisms. It is recommended to spray Germ Clear™ directly onto the bird droppings from a distance of 10 – 15 cm, to damp them down. Leave the spray to soak in for at least 1 minute to ensure the Germ Clear™ formulation can get to work. We recommend soaking the area completely to gain full penetration into the driest bird droppings. After 1 minute, use a metal scraper to remove the larger bits of debris and pigeon guano. Respray the area with Germ Clear™ Bird Droppings Disinfectant Spray and then use a stiff brush to remove further pigeon poo. Finally, respray again and use a damp cloth to wipe the area clean. Then leave it to fully dry before installing pigeon spikes.